If you put something green in a food processor with cheese, olive oil, and garlic, good things will happen. This is an important lesson that we have learned from the Italians. We should eat more fresh ricotta. This is the lesson that we learned from Food 52's recent contest, "Your Best Recipe with Fresh Ricotta" which featured an amazing and mouth-watering variety of dishes with ricotta (if you aren't familiar with Food 52, please go check it out - lots of good things are happening over there). Like its cousins fresh mozzarella and burrata, ricotta adds such a pure, sweet cream flavor to any dish, and the texture is wonderful wrapped around big pieces of rigatoni. We especially loved the runner-up in the ricotta contest, this delicious Rigatoni with Sausage, Peas and Ricotta (and from that recipe we learned that Italian sausage is much more flavorful if you brown it in the casing and chop it, rather than removing the innards before cooking them). And we finally gave in and decided that it's worth getting the good quality ricotta, the kind that is freshly made and comes in a clear container and is priced by weight, rather than the pre-packaged big brand name kind. It takes ricotta from being just a filler to being a major flavor and texture contribution in the dish. Broccoli and sausage go brilliantly together. That's not something that we've learned recently; it feels like we've always known it. It feels like a universal truth, some basic formula like the Pythagorean theorem: a2 + b2 = c2 , broccoli + sausage = deliciousness. So, here's what we did: we put some broccoli in a food processor with parmesan, olive oil, and garlic to make a pesto (we didn't put any nuts in this one as you would in a traditional pesto, and found the texture without it to be quite nice, but feel free to experiment and let us know how it goes). We saved a lot of the broccoli florets and browned those with some Italian sausage. Then we tossed everything with a big bowl of rigatoni and fresh ricotta. Chop/break up the broccoli into individual florets. Set aside about 2/3 of the broccoli, which you will reserve to toss with the pasta. The remaining 1/3 will be used for the pesto. Include a little bit of the stem. 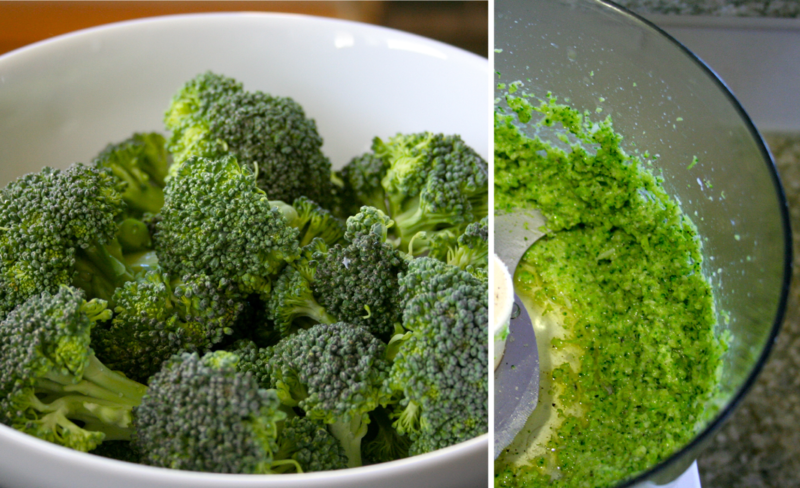 Bring a medium pot of water to boil and add 1/3 of the broccoli; blanch until broccoli are bright green and just tender (about 3-5 minutes). Remove the broccoli from the water, and place into a food processor with the parmesan, garlic, and salt and pepper to taste. Puree until well blended, then, with the blender on, slowly pour in the olive oil. You can use slightly more or less until the pesto reaches the consistency you desire. Set pesto aside. Fill a large pot of water and bring it to a boil while you prep the sausage and the rest of the broccoli. Add a dash of oil to a large skillet and turn the burner on to medium high heat. Put the sausages in the skillet whole (still in their casings) and brown them (they don't need to be cooked all the way through; you just want to get a nice brown on as many sides as possible). Remove to a cutting board and cut in half down the middle lengthwise, then into slices. Put the slices back into the hot skillet to get them fully cooked and browned. Deglaze the pan with white wine as necessary (throw in a splash as the pan gets dry, and then use a spatula to scrape the browned bits off the pan), then remove the sausage to a plate. Give the pan another quick deglaze, then add the uncooked broccoli florets. Cook until they are nicely browned, deglazing as necessary, then turn off the heat if your pasta is not quite ready yet (if you have a cover for your skillet, you can use it steam the broccoli while it browns, which will help cook it through a bit faster). Cook the rigatoni according the box's directions, reserving about 1/3 cup of the pasta water just before you drain it. 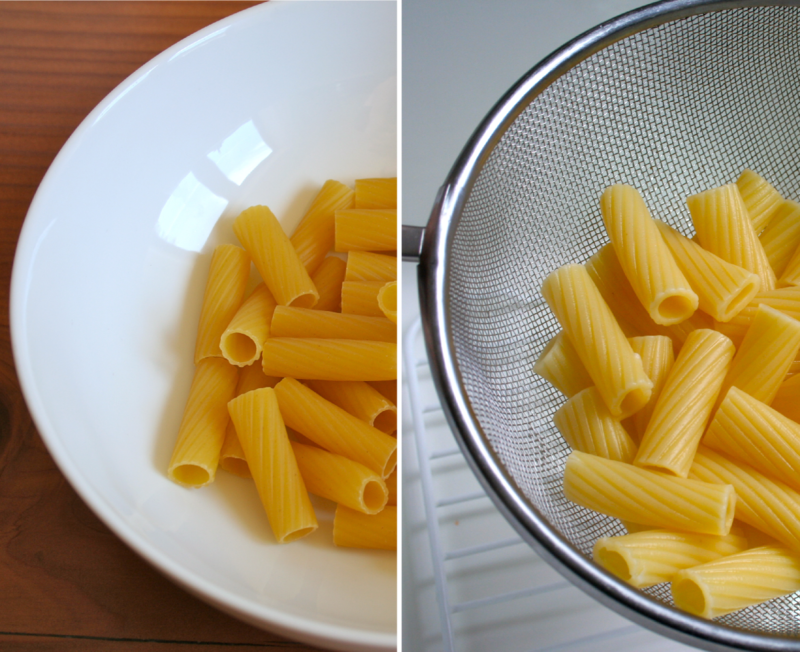 The idea is get the most pasta-y water possible. Drain the pasta, then add it back to the skillet with the broccoli, sausage and pesto. Just after you add the pesto, pour some of the pasta water in to loosen up the pesto and help it coat the pasta. Add just as much as you need to coat. Serve the pasta in bowls and top with healthy dollops of fresh ricotta. Sounds awesome. Can't wait to try it. broccoli pesto sounds really interesting - is it at all reminiscent of regular pesto? this dish is really great for summer entertaining. can't wait to try it out when I come home from college! Thanks all! It has a lot in common with regular pesto, since the parmesan, garlic, and olive oil are strong presences, but you definitely taste the broccoli.